Namocart has come up with an exciting loot offer for customers who register with them. They are offering selected mobile screen guards at Rs.1. Who will miss this Namocart loot deal? Hurry up and grab your desired screen guard before the offer ends. Namocart.com is India's largest desi online shopping website. Namocart was started in the year 2015. They cover every corner of India including rural and remote places. Their aim is to provide good quality branded products in best price. They are headquartered in Bengaluru. Namocart bears a strong foundation which is inspired by "MAKE IN INDIA". Shashi Kumar is the founder of Namocart. 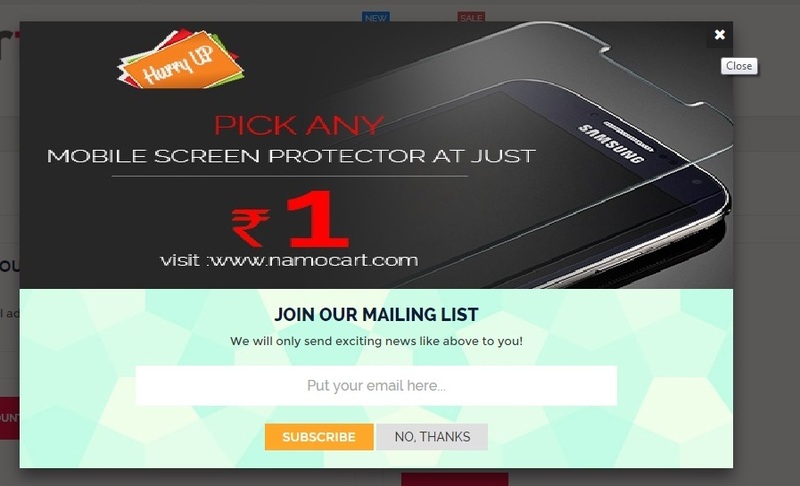 How to avail Namocart 1 rupee screen guard offer? 2. Mostly you will get a popup with the above message. Just subscribe with your email details. 3. If you have not received any popup, go ahead and register yourself. 4. Visit 1 rupee screen guard offer page here. 5. Browse through the available screen guards and select what you like to buy. 6. Add the selected screen guard to your cart. 7. Make payment to buy. 1. Shipping charges might be applicable. 2. This Namocart offer might be terminated or modified anytime by the company. Hurry up. 3. Namocart's terms and conditions are applicable. 4. It might be a limited time offer.